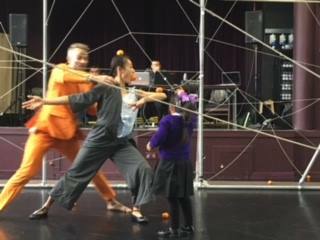 After the successful tour of Whiteout in Japan this summer, it has been great to be back working on Playful Tiger, Barrowland Ballet’s new production inspired by our productions Tiger Tale (7+) and Tiger (Adult and young people 14+). Playful Tiger is a version of the show being made specifically with and for children and young people who are profoundly autistic and mainly non-verbal. In my opinion, Tiger, Tiger Tale and Playful Tiger are all like books. Tiger is like a novel; describing imaginary characters and events with some degree of realism. Tiger Tale is like a picture book where a story can be with or without words and with images that play a major role in bringing out the story. With new production Playful Tiger, it feels like an interactive storybook; the story is packaged full of sensory, interactive elements. During rehearsals this week, we have been working to summarise the story and define the essence of each section of the performance. We’ve also focused on designing the sensory experiences and the interaction section for our audiences. As a performer, I have been working on my character’s (Mum) journey, creating a sensory profile and discovering how to interact with audiences. We had two sharing’s with pupils from Isobel Mair School and St Albert’s Primary this week (images above). I was very pleased with the result as I found a positive way to perform and interact with the pupils. However, Playful Tiger is still at the devising stage, it changes every day and there is still much to learn before the premiere show next Friday. As an emerging artist, a question raised in my head recently. “What kind of performances would challenge the idea of your profession?” Playful Tiger pops up in my head; It challenges my ideas about what performances for this audience would look like. I am very proud that, as a team, we are making Playful Tiger to offer new and fun experiences to them. I am very much looking forward to opening the show and enjoy dancing, singing, storytelling and taking risks…with our audience.